When I was teaching Pre-Kindergarten we often did murals for two reasons, the first being cooperation, the second for the benefits that working on a vertical surface offers. Fine motor development is crucial for learning how to write. We often take our hand ,wrists and arm muscles for granted because we use them for so much but young children are still developing and strengthening theirs, this is a great exercise for them. Gather your materials. 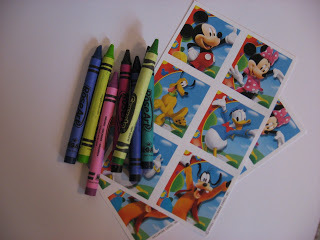 You will need some paper, crayons ( you’ll want washable) , and some stickers. 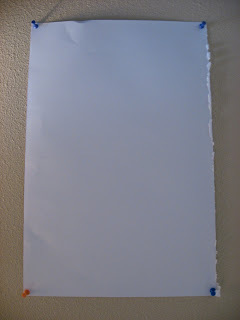 Pin or tape the paper on your wall our child’s eye height. Painter’s tape is perfect for this, because it also gives your child a boundary to know not to color past. I keep forgetting to buy more! Next offer up some stickers. When they are peeling off the stickers they are also working out the muscles in their fingers, Use larger ones for beginners and smaller ones as they master the skill. My son worked on his mural on and off for an hour and a half, lots of practice with very little prep! I have an inexpensive easel for just that! We have a chalkboard on one side and a plain side that we can put paper on for painting and drawing. YIKES. I don’t about drawing on my wall. Oh wait, it isn’t really MY wall. its my mom so I guess its ok! Hah. 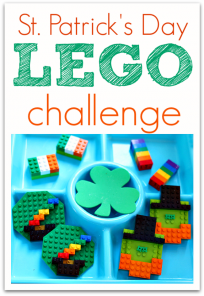 I think this is an awesome activity! 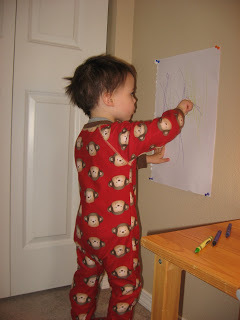 We need to work on fine motor skills and I love the idea of teaching my son “boundaries”. I don’t know how you come up with so many clever ideas! I think I’m your biggest copycat. I admit I was a little apprehensive about doing this but I used washable crayons and there was one single tiny bit of crayon that ended up on my wall, and I rubbed it off with my finger! I praised my son to high heaven for keeping it on the paper and left the stickers out for him to keep playing. Thanks so much for the fine-motor activity! I do often have kids peel stickers off of the paper when we're doing our letter pages (on our letter Uu page, where the Uu is written in block letters, I had them color the Uu in blue & then peel off fish stickers to make an "underwater" scene…We're going to play with clay next week & try to find buttons hidden inside of it! Should be lots of fun for fine motor development! My daughter loves this project…ever since she was little I would put a piece of paper on the wall for her to doodle and add stickers too. The painters tape is a great idea for creating a boundary! I noticed you didn’t give your little one the tape boundaries…and one little mark isn’t so bad! I will try this with our washable crayons, too! Only because I couldn’t find my tape ! I refuse to buy more because that stuff is costly and I know in my heart it’s somewhere in this house… not sure where but I’ll find it! Love the painter’s tape suggestion! 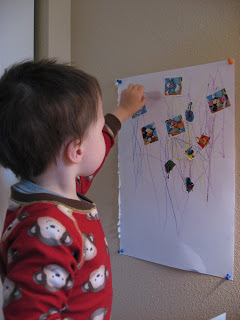 love this activity, I am thinking I could tape it on our sliding doors too, crayon wshes off of those really well. As do markers great idea! My daughter still has trouble keeping the marker on paper and not the table. Just today, I had to take soft scrub to it again. Poor table, it’s sure been loved! I left you an award on my blog! Come check it out. We have steel cupboard doors, which I cover with old newspapers, and over that, drawing sheets go on with magnets. We had so much fun with this. It was a nice day so we did it outside in their playhouse. Most days I find an activity from your site to do when my two wake up from nap. Thank you!! You could probably do the same thing with window markers so that they can draw on the glass doors and windows. I know my son will love it, so I think I’ll try it! I’m back! I tried the mini mural earlier today. 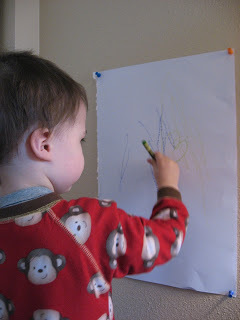 I taped it onto the wall above the couch so he can stand on the couch and color (I would’ve done it so he could stand on the ground, but every wall of our playroom has something in front of it) and he has been coloring on and off all day. He loves the idea of coloring “on the wall” and I told him to keep it on the white, not the yellow and he totally gets it! It is probably his new favorite thing besides craft time! Thanks Allie! Quick tip, we use white contact paper that we lay on the wall to keep the kids from actually writing on the walls… Works wonders and peels right off when we want to take it down!